Enhance Your User's Experience with RVT Columns for Windows Explorer / File Explorer. Show the Revit version and Revit build in Explorer columns. 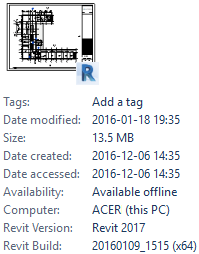 Even in file dialog boxes within Revit. 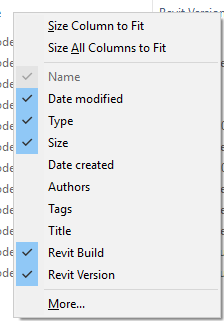 Sort files in Explorer based on any of the columns available like the Revit version. InfoTip (ToolTip) with version and build can also be seen when hovering over a file. No need to have Revit installed. That means that everyone at your company can see this information. 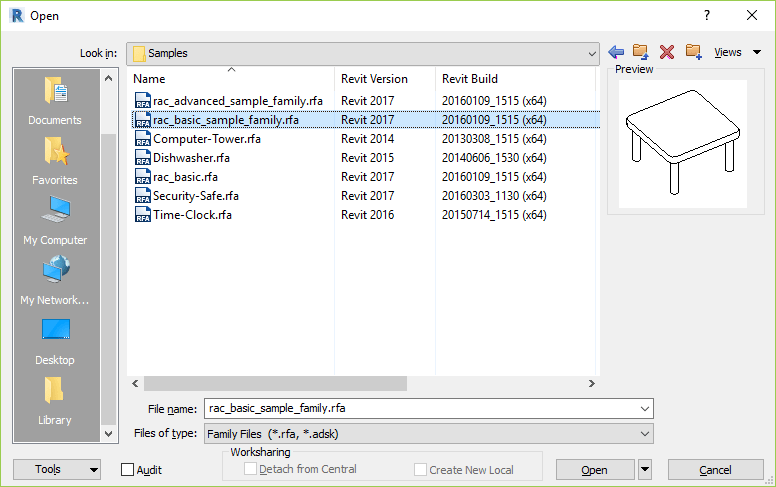 Now you can know the Revit version and Revit build before even opening the file. Project and Family files are supported and extensions and file types supported are RTE, RVT, RFA and RFT. Column names can be customized for example from "RVT Version" to "RVT Ver" or into other languages. Directory Opus support: Right click on this link RVT_Columns.vbs.txt and save it as RVT_Columns.vbs without the .txt extension in the folder %appdata%\GPSoftware\Directory Opus\Script AddIns. The file can also be dragged and dropped into the Scripts dialog box that is access from Settings>Preferences>Toolbars>Scripts. The trial app works with full functionality for 30 days. RVT Columns trial can be downloaded and installed as an app from the Autodesk App Store site. The full version that you receive when purchase is done will show all properties all the time. Contact us for downloads of full version if you are a customer. Scripted installation possible. Contact us for details. See also the documentation for how to run the installer silently. Subscribe to our RVT Columns newsletter or any of our other Newsletters. Windows 10, Windows 8.1, Windows 8, Windows 7. 32-bit or 64-bit. Windows Vista may work but is not supported. This works with RTE, RVT, RFA and RFT files. Microsoft Visual C++ 2015 Redistributable Package is required. If used together with FreeCommander on Windows 64-bit make sure the 64-bit version of FreeCommander is used. Directory Opus 12 (file manager for Windows) and newer has support for RVT Columns. See download tab for further details. Compatibility with any application that creates Revit files. 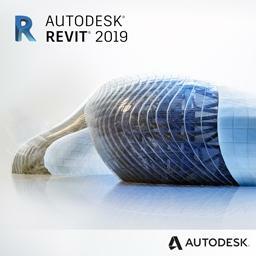 Revit does not need to be installed but this works with Autodesk Revit, Autodesk Revit Architecture, Autodesk Revit MEP and Autodesk Revit Structure. 25 USD for one license or less depending on the amount of licenses. RVT Columns can also be downloaded, installed and purchased as an app from the Autodesk App Store site. Installation and uninstallation usually requires administration rights. For upgrading it is recommended to uninstall previous version, restart or log off/log in, delete any remaining files in the installation folder RVT Columns and then install the new version. Run the setup .exe and follow the instructions. Usually a restart or log off/log in of the computer is needed as explorer.exe needs to be restarted. If you get "The installer has encountered an unexpected error installing this package. This may indicate a problem with this package. The error code is 2203." you can try to install again or make sure to close or disable applications that locks files like anti-virus programs or backup programs like Carbonite. Restart Explorer or log out from Windows and log in again to see the change. If special characters like German Umlaut is used saving with Notepad might make the file not working. Open the file in Notepad after saving it and check if the descriptions look like expected or not. If there is a problem, try instead Ultraedit, Notepad++ or Notepad2 to make the saving with. Right click on the column header in Explorer or in a file dialog box in Revit and you can select columns to view or hide. When you click on More... you can select among all available details to show. The columns start with the Revit prefix. Now it is possible to quickly see Revit Version and Revit Build or to sort on any of them. Rearrange the column order as needed by dragging and dropping them one at a time or use the Move Up or Move Down buttons in the dialog box "Choose Details" showed above. Here is what it look like in Explorer. 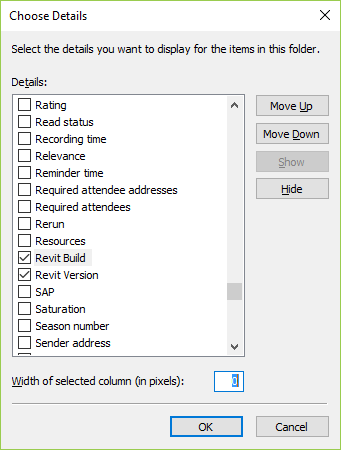 Here's the columns in the Revit Open dialog box. If you want to show these columns in all your folders take these steps in Explorer: Select Tools or View from the menu and then select Folder Options or Options. On the View tab click on Apply to Folders. How to determine what update has been applied to Revit from the Build number. See Revit Build versions and Build numbers. 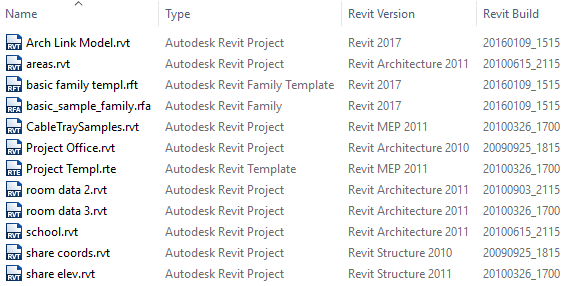 RTE (template) files and RVT (project) files are actual Revit projects. The difference between the two is that the template is used to start a new project. When you click on Save, you will not be allowed to overwrite the template file, but you will be prompted for a new file name and location. RFA (family) files and RFT (family template) files are family files that can either be loaded into a project or saved externally. Family template files are used to start a new family from scratch and family files are typically used to exchange families between projects. If there are troubles after upgrading, first step to try is uninstall, delete any remaining files in the RVT Columns folder and RevitBasicFileInfo.dll in the System32 folder. A Windows restart or log out and log in might be needed to manually delete remaining files. Then install again. Error: “Module C:\Program Files\JTB World\RVT Explorer Column Handler\RevitPropertyHandler.dll failed to register. HRESULT -2147024770. Contact your support personnel.” Contact JTB World for help. If you browse folders that are located on a server that you are connected with through a slow connection (WAN) you may notice that Explorer performance is slow. This is unfortunately a side effect of the need to read all files to be able to show the properties. It seems like newer Windows versions handles this better. 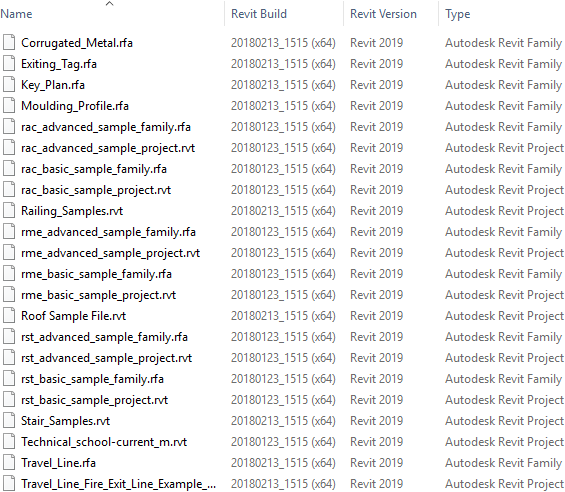 If opening an older version of a Revit file in a newer version of Revit and after upgrading and saving to the newer version, the 'Build' and 'Version' don't populate in an external windows explorer or from within the Open dialogue box until the model is completely closed. 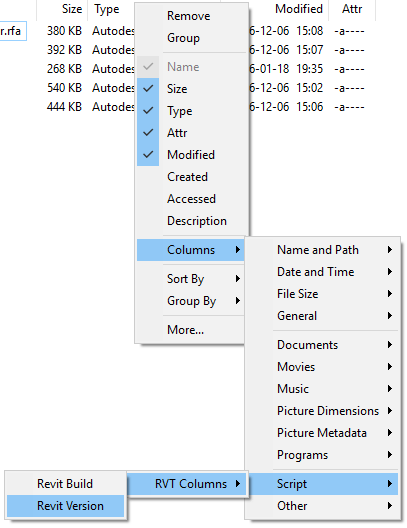 Some older versions of Revit may not remember columns set up in file browsing dialog boxes like Open and Save. Do you have need to see also Explorer Handler support for MicroStation DGN files or other file types? Do you want to see custom properties in RTE, RVT, RFA and RFT files as columns?